Weather-related phobias are a type of natural environment-related specific phobia. Just as a phobia can develop of any object or situation, any type of weather phenomenon can become the subject of a phobia. 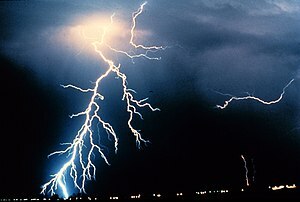 Some common weather-related phobias include astraphobia, brontophobia, or tonitrophobia (fear of thunderstorms), aluchophobia (fear of darkness), anemophobia (fear of wind), lilapsophobia (fear of tornadoes and/or hurricanes), heliophobia (fear of sunlight), cionophobia (fear of snow), or cryophobia (fear of ice or frost). These phobias, just like most phobias, can be easily treated by self-help in mild cases, or with the help of a professional therapist. If the phobia is severe and self-help has not alleviated it, professional therapy may be required to treat it. Medication may help control day to day anxiety associated with the phobia, or to control panic attacks, but it does not eliminate the phobia itself. Some literature and many phobics assert that the side affects of medications used are as bad as the phobia! If you have been through a natural disaster like a hurricane, tsunami, or tornado, and are experiencing memory loss, flashbacks or otherwise relive the traumatic event during the day and/or night, and/or find yourself feeling numb or hypervigilant, you may have posttraumatic stress disorder (PTSD), and you may need a different type of treatment than that discussed here. Please see a counselor or psychologist. Avoidance does not treat a phobia. Phobics might move to a geographic area where the object they fear is rare or unseen, or otherwise change their state of affairs so they will not have to face their feared situation. In fact, this makes them feel better to some degree, so they might think they no longer have the phobia. Weather phobics may do this to get away from the prevailing climate in their current area. For example, a lilapsophobe might move from the Midwest to Oregon to escape tornadoes. Unfortunately tornadoes form everywhere, including every state of the union and all over the world, with the exception of the polar regions perhaps! In most cases, weather cannot be avoided. There are two problems with avoidance: First, the phobia hasn’t been treated by running away from it. You might discover this if you unexpectedly encounter the thing you fear –and in fact, the fear may actually have grown stronger! Second, the avoidance behavior has done nothing to help you learn how to deal with symptoms of the phobia if an encounter should occur. Help yourself with a few tips before actually attempting treatment: Almost everyone with a phobia knows that their fear is greater than the actual danger represented by the object they fear (children may not be able to realize this until they are older.) Usually, this knowledge does not actually help decrease the strength of the fear. But perhaps your fear of being struck by lightning or hit by a tornado might be helped by knowing that the chances of these events are very small. Also, knowledge of the conditions under which severe thunderstorms and tornadoes form helps weather phobics realize that not every storm can produce a tornado, and only certain storms actually are likely to produce a tornado. Memorize and write down a preparedness plan: What will you do to be safe in storms? What will you do to take shelter from lightning, tornadoes, floods, or other hazards if you are outside, in a building, in a mobile home, or in a car? If you have a safe room or storm shelter at home, or can afford to get one, you’ll find that your peace of mind and your fear of the weather will be eased a great deal. Also, learn how to relax (I’ll discuss this more below). Avoid patterns of thinking that make fear worse: Don’t generalize or foretell the future: “Oh no, this storm is horrible, there will be a tornado here”, or always assume the worst: “That big fluffy cloud means there’s going to be a really bad storm. I need to get in the storm shelter now.” Trying instead to substitute positive thoughts may seem extremely difficult at first, but after a while, you will welcome the distraction from the train of negative thinking that can lead to panic. Try “The storm is not predicted to be severe,” “the chance of rain is only 10%”, or “there is only one cloud in the sky; there probably isn’t a storm coming in.” If you are phobic of winter weather, realizing that higher temperatures usually dispel a predicted snowstorm may help you avoid panic over the possibility of driving through a snowstorm. Learn to recognize the voice of your phobia. If you’ve had a phobia for a while you probably subconsciously feel as if your phobia is your most constant companion. This might strike you as a sad idea, but being severely afraid of something for months or years on end makes one almost intimately familiar with what I personally think of as “the voice of my phobia.” I have lilapsophobia that only months ago kept me in a mild state of panic about 70% of the time. When I went outside and it was cloudy, my phobia told me to get home, there would be a be a bad storm out here. When I drove through an area of tornado damage, my phobia either told me to get out of there as fast as I could, OR it told me there probably would be another tornado, so I should get out of there as fast as I could! When I was at home, my phobia always insisted I check the weather forecast morning, evening, and night (and more if I was able to). Forecasts of tornadoes gave me panic attacks, and after we got our storm shelter, my phobia directed me to it. In any case, once you recognize the voice of your phobia, you can rebel against it. You can get furious at it. Tell it to shut up, you are the boss now!! You can, after all, do what you want to and not what it tells you to! Learn to relax when your phobia acts up. Relaxing doesn’t mean taking a nap (although that can help, if you are in an appropriate place and a good time). First, do the following: consciously tense and then relax your muscles, from one end of the body to the other. Usually if I am getting panicky, I am already tense! All I have to do is just relax everything. While you are relaxing your muscles, take deep breaths. Concentrate on your breathing. Unless you are in immediate danger (if the tornado sirens are blasting, get into the storm shelter! :), forget about everything else going on around you. Lie down on your back. Take a deep breath in for 3-4 seconds, as long as you are able to, through your nose, using your abdomen and not your chest. If you aren’t used to doing this, put a hand on your chest and one on your abdomen and make sure the hand on your abdomen rises and the one on your chest moves very little or not at all. You will need to slow down the rate you are used to breathing in order to inhale for 3-4 seconds. Someone else can count the time for you or you can pay attention to the seconds on a clock or watch. Then exhale for 6-8 seconds, twice as long as the inhale, through your mouth. You may find after practicing this for a while that you feel a little sleepy, but your panic will get better fast. Practicing when you are not in a phobic situation will help you relax and breathe effectively when you are. Write down your feelings about your phobia. You can include the frightening daydreams or nightmares you might have that reinforce it, why you think it came to be, and the symptoms you had in the past versus the symptoms you have now. Explore what you feel like in different situations: when you think about your feared object, when you talk about it, see pictures of it or see it in movies, or are actually close to it in real life. This might be emotionally very difficult. You may cry or feel panicky. Remember you can do this as slow as you want to. Remember to stop and relax whenever you panic. Talk about your phobia and the information you wrote down with someone you love or get along with well. You might have a mild to moderate panic attack simply talking about the thing you fear. Again, make sure you are in a safe situation. You can stop, relax and continue again later. You will gradually feel more comfortable talking about your phobia and for longer periods of time. Make a list in order of ascending anxiety caused by each item, of the things or situations that frighten you. This means that things that hardly bother you at all will begin the list, and whatever scares you the most will end it. For someone with astraphobia, the list may begin with a sunny, calm day and end with being caught out in a severe thunderstorm. Assign numbers on a scale from 0-10, 0 being the least scary thing and 10 being the most scary. Consider things that you might not have done before to begin exposing yourself to your fears. Can you look at photos of clouds or of storms? Where would that fit on your 0-10 scale? How about a photo of a raging thunderstorm with lots of lightning? 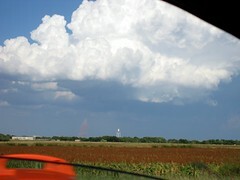 Or, a video of a thunderstorm (there are many of these to be found searching the internet)? If you were driving during a thunderstorm, where would that fit on your scale? Next, begin systematic desensitization (made famous by Joseph Wolpe in 1961). Start by exposing yourself to the things on your list. Start with the ones that scare you the least. Relax and do slow and deep breathing like I described above. If you feel any panic while you are exposing yourself to the weather or to your images, sit back or lie down and relax and breathe some more. You can go do something else and then return to the session later. Repeat any particular exposure session that you did not feel totally confident about the last time. When you aren’t at all scared of something that did scare you before, you have completed that session. If you are beginning with things that really don’t bother you at all, you will be much less likely to panic and you probably will be very confident to go on to the slightly more scary things. Your phobia might feel worse once you begin this process and begin dealing with items you know are scary, even if you left and relaxed before continuing. If this happens, you might want to go back and work on things you were less frightened when you were exposed to them. Then, return later to the point at which you began to feel more phobic. You may have caught up to that point then. Relaxation before, during, and after exposure therapy sessions can be assisted by other things like: being held by someone you love, eating a nice meal, talking to a friend or doing some other distracting thing, taking a nice bubble bath, or alternately doing something to release your anger at being scared yet again (beat up a soft toy or pillow, yell loudly, or throw a temper tantrum on the carpet). After this, relax and deep breathe again. Follow this procedure for all the items on your hierarchy of frightening things. If you have an ultimate fear that, like like mine (tornadoes) is life threatening, you can still be successful at desensitizing it indirectly by imagining all the panic symptoms you would go through if you actually met one, and then use something less dangerous (a tornado warning, even a mock one, when you are at home and can get in your shelter, perhaps) to completely desensitize yourself to all the panic symptoms. Don’t forget to relax before, during, and after the experience! Additionally, making a written plan available for tornado safety under all situations at home and away will be surprisingly helpful at taking the wind (pun intended) out of the ultimate fear. 5.Professional Therapy. Most literature on phobias indicates that if self-help attempts at treatment don’t work, if the phobia is interfering with your life or your career, and the fear is frequent and intense, then you should seek professional treatment through a psychologist or a licensed professional counselor. My observation is the following: IF you wait until you are positive that all of the above conditions are met before seeking therapy, your phobia may be so severe at that time that you may require quite a few more sessions than you would had you started therapy earlier. Most therapists treat weather-related phobias successfully with systematic desensitization, which I just described. Some prefer what is called “graded exposure therapy”, almost identical to desensitization except that it does not use a relaxation response during the exposure. My personal view is that it is more challenging and has more of a chance of setbacks (“resensitization”). Most insurances cover phobia treatment, although they may be picky if you have a PPO network and your therapist doesn’t accept that plan. You might end up being charged 20-30% more than your copay. A number of other types of treatments for phobias are available now, if you have the resources, since insurance may or may not be willing to cover these. These alternate choices include virtual reality exposure therapy (you can be exposed with complete safety to anything, including very nasty storms! ), hypnosis and NLP (neuro-linguistic programming) as well as EMDR (eye movement desensitization reprocessing). If you find a certified therapist in these techniques, I have read that some guarantee them for 7 years. This entry was posted in Weather Phobia Related and tagged anemophobia, articles, Astraphobia, Battling a Weather Phobia, environment, fear, health, help, Karin R. Herrmann, lilapsophobia, mental-health, nature, Panic attack, Phobia, Posttraumatic stress disorder, science, Specific phobia, Storm cellar, support, Thunderstorm, tonitrophobia, Tornado, weather, WX by Thomas Spychalski. Bookmark the permalink. Bourne, Edmund J. 2010. The Anxiety and Phobia Workbook, Fifth edition. New Harbinger Publications, Oakland, CA. Gardner, James, MD and Arthur H. Bell, PhD. 2005. Phobias and How to Overcome Them: Understanding and Beating Your Fears. The Career Press, Inc. Franklin Lakes, NJ. Neuman, Frederick. 1985. Fighting Fear: An Eight-Week Guide to Treating your own Phobias. Wow, thanks very much for those kind words. I am not a hero though, just a normal guy who still mildly suffers from the same stuff you did and wanted to try and make a difference as no one seemed to be aware of it at the time (most articles on the net were for kids and dogs lol…what a blow to you not feeling like a baby or a little weird for having this kind of phobia eh?). That said, the writer of the article you posted this on, Karin, deserves much love as well. Thanks again, took me by surprise lol, never heard myself described in such glowing terms. Whenever i see the clouds i feel that it will rains and everything will be destroyed i will die or quickly i check the weather forecast to know about the weather….i m very tensed kindly give me some suggestions….. Does Video Prove Life After Death?